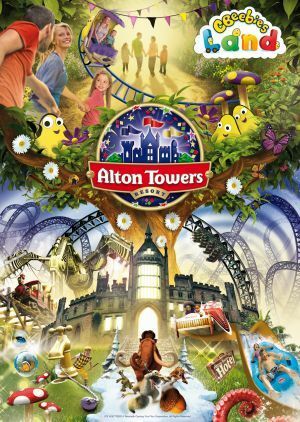 Alton Towers, these days owned by Merlin Entertainments Ltd, is one of the largest British theme parks normally attracting up to 3m grandparents, parents and children annually. The London Stock Exchange listed company also runs Madame Tussauds, The London Eye, Chessington World of Adventures, Thorpe Park and Warwick Castle, plus a whole host of other attractions worldwide. In June the famous Alton Towers Smiler roller coaster with its 14 inversions suffered a serious incident, later attributed to human error. Not for the faint hearted it was one of the most popular rides at the resort. The park shut for several days. In the most glorious part of the autumn the editor in chief and lady wife were persuaded to overnight at the Derbyshire resort, exactly halfway between East Midlands and Manchester airports. Taking our grandsons was part of the deal. Alton Towers wants the world to know it is now very much business as usual with the re-opening from the winter break on 19 March, just before Easter. We are told that Smiler will be part of the offerings for the 2016 season. And as you will read later on ‘Fast Food’ has a new meaning. The historic Alton Towers estate was a former seat of the Earl of Shrewsbury, and for most of the 19th century one of the great houses of England, making Downton Abbey seem Insignificant. More than 13,000 trees were also planted in the landscaped parkland, most of which remain for our pleasurable viewing. Alton Towers suffered from the fall-out after the Great War like many of its contemporaries. During the 1960s and 1970s the grounds were redeveloped as a visitor attraction. 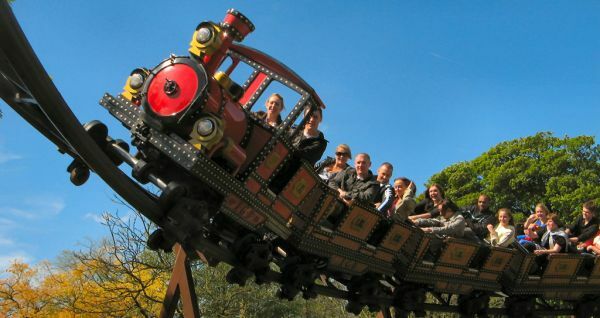 Alton Towers began its evolution into a major theme park in 1980 with the installation of The Corkscrew rollercoaster, the Pirate Ship and the Alpine Bob sled ride. A year later the Log Flume opened and in 1984 the park's second roller-coaster, The Black Hole, arrived. Throughout the next decade, more attractions, areas and rides were introduced. For us it was a two-day adventure overnighting at the Woodland Lodge, part of the resort but outside the actual park, offering fairly basic accommodation. Evening dining was at the nearby Alton Towers Hotel. 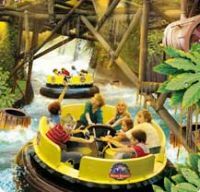 Splash Landings Hotel is part of this resort complex which also includes the Alton Towers Waterpark, wet fun in a Caribbean extravaganza. It went down very well with our 10 and 14-year olds. There are plenty of adrenalin-pumping water thrills for the whole family, including the Little Leak – a shallow area full of interactive play features and slides for tiny tots. Whoever wrote the librettos for Alton Towers was brilliant. In the park itself there is ‘Cloud Cuckoo Land’ (for the little people including a driving school), ‘Mutiny Bay’ (with battle galleons park guests firing water cannon at each other – great to watch but rather wet if you are involved), and ‘Katanga Canyon’ (a runaway mine train and Congo river rapids – water once again and no way out). 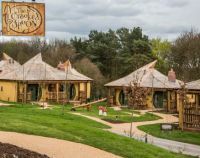 New this year, and close by Woodland Lodge, ‘Enchanted Village’ features five treehouses each sleeping a group of up to eight people in four separate bedrooms. Individual treehouses have their own unique style with luxury furnishings, self-catering facilities, a relaxing lounge area with 50” plasma TV and games console, and an outdoor decking area with private hot tub overlooking serene woodland. If one is staying in the hotel complex area the best way into the theme park itself is on the monorail. But be warned, like everything in the whole extravaganza queuing is the name of the game, it being seemingly inevitable no matter what kind of ‘fast track’ pass you have. To be fair Alton Towers has put much effort in for those with disabilities, genuine cases able to bypass most of the lines. 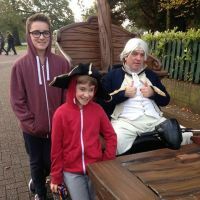 Unlike Disney, where there are upmarket eating facilities, at Alton Towers it is fast-food throughout, very, very popular with the kids, less so with their minders. The hotel dining is a little bit smarter. The real question is where to start. There are over 50 rides and attractions. Having done our reconnaissance on the first day we took the Skyride to the top of the park, watched the Ice Age, 4D cinema experience and gradually made our way past Alton Towers itself. There’s plenty to do even if you don’t like the scary rides. Charlie & the Chocolate Factory was a sedate ride, not so Nemesis, inverted and even without Smiler said to be one of the world’s finest roller coasters with G forces greater than the Space Shuttle. We watched and the Pirates of Mutiny Bay entertained. The inside of the Haunted House was not for our party. They preferred the archery demonstration with free participation. Sadly there was no time for either of the two wacky golf courses themed around some of the most famous rides and attractions. Alton Towers Resort will bring a new meaning to the term ‘fast food’ in May 2016, when it opens the UK’s first Rollercoaster Restaurant, a new dining concept which will be available for exclusive corporate hire. The new restaurant will see dishes travel along more than 400 metres of spiralling steel track – the equivalent of an Olympic-sized athletics track and reaching speeds as fast as Mo Farah, before its delivery to the table. Set beneath a vast rollercoaster, the new restaurant will allow diners to watch their food tackle two gravity defying loop-the-loops before dropping 26ft – the equivalent of two double decker buses – down a tornado spiral track to their table. Each plate will travel an average of 173 miles each week, the same distance between London and Sheffield, with every dish put through rigorous testing at the Resort’s test centre to ensure the food can withstand the extreme force. Whether it is breaking the ice at a teambuilding dinner or adding something extra to a corporate away day, the new restaurant will most certainly put a twist on any corporate event. The restaurant will be available to hire exclusively for up to 150 dining delegates from 13 June 2016. The restaurant will be accessible via a walkway running from the Alton Towers Hotel, right into the heart of the Theme Park, and will offer a new premium menu for evening events. You need a minimum of a night-stop to really achieve anything at the park, unless you have been before. If your visit is short, look at the website before you go and make a plan of what you want to do, saving on time and energy by mapping the best route possible for the activities that best suit you. Or ask the Park to put a map in the post.